When SUQQU posts a teaser of their new collection I'm immediately intrigued - especially if I see that the SUQQU Senior Makeup Artist Jorge Bazaretti has been working on it. I'm working on some posts featuring more bits from the permanent Summer 2018 collection, but as the launch of the UK exclusives approach I decided to re-schedule my posts. I hope you can enjoy this post and swatches in the case you're wanting to grab something! The collection is themed on "Gradation Couture" - which offers an antique floral gradation into rich modern shades. The gradation can also be seen in the blush (Pure Color Blushes always have a gradation) and the top left shade of the eyeshadow palettes (special feature). The collection mixes a variety of textures inspired by antique couture, but the overall spirit is fun, young and spontaneous. For me personally SUQQU is always elegance and sophistication so I enjoy the fresh, energized take on the Summer collection. The collection features 1 Pure Color Blush (£32), 2 Designing Color Eyes (£46 each) and 2 Extra Glow Lipstick (£25 each, all items limited edition). Due to the popularity of this collection, the mail requests and waiting list became full in a blink of an eye. SUQQU will contact those on the waiting list if there is additional availability from cancellation. Selfridges will have 2 weeks exclusive preview from 26th April and launches on counters in Harrods & Fenwick Bond Street stores on 10th May. Check your nearest counter or keep an eye on the online shop! 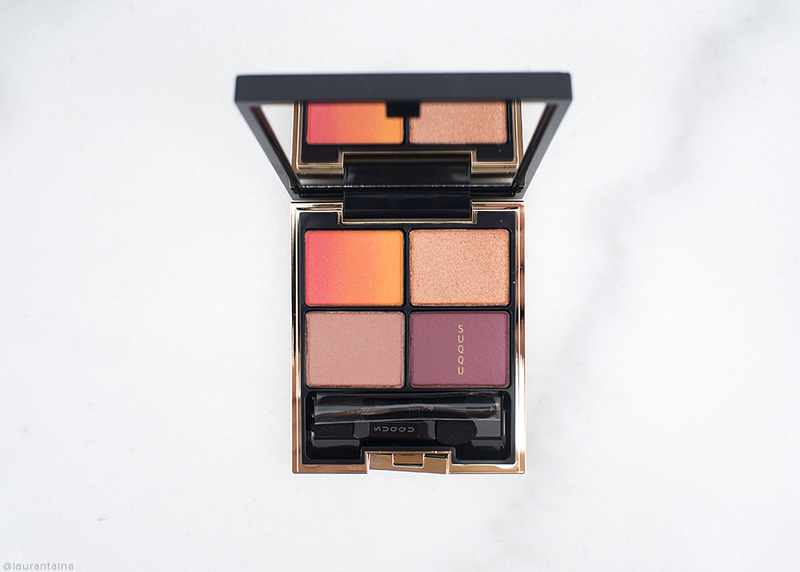 SUQQU translates this eyeshadow palette as 'Burning Sand'. It has a gorgeous, gorgeous pigmentation and a variety of finishes from delicious matte coral and orange, shimmering copper and satin purple taupe and purple. The shadows are inspired by the summer-sun setting skies, hot sand on beaches and contrasted by the purple-burgundy. I think SUQQU and Jorge nailed this palette: it has a great variety in both finishes and color. The shades play together beautifully, pack a punch in pigmentation and blendability is excellent. There is little powder kickoff, when you press your brush into the pan so I wouldn't say these are too hard pressed. Despite loving top coat glitters I like that this coppery glitter shade (top right pan) has some decent color as well. There is no dud in this palette. Best of all, I feel inspired looking at this palette and I can come up with multiple interesting looks. Kouki is inspired by the summer flowers of the semi-tropical islands of Japan (think of, say, Okinawa). I immediately thought about Japanese peaches or 'momo' as the color is very fresh and juicy - if you've never seen a Japanese peach they are huge in size and most delicious fruit there is! Extra Glow lipsticks are not glass-like glossy or have any pearl, but their moisturizing texture gives a beautiful, healthy and plump sheen on the lips without feeling heavy. That being said, they aren't very long-lasting on the lips and might slip and slide a bit. If you suffer from chapped lips and enjoy a wash of color with a single stroke, these conditioning lipsticks might be a hit for you. Fresh true coral peach color. 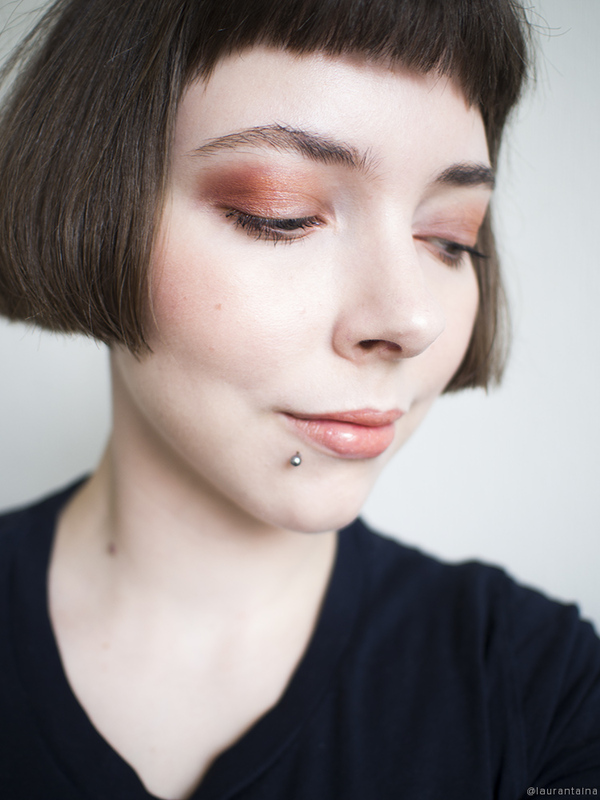 I used top left pan and did a gradation on my mobile lid, shading the taupe color near inner corner, purple in the outer corner and copper shimmer pressed on the top with finger. A couple of swipes of 110 KOUKI lipstick and 106 HANAIROKA blush (review here). Eyebrows also SUQQU the Volume Brow Mascara (review here). Might sound cheezy, but I can feel the warmth of the Sun and sand under my toes when I look at this collection. SUQQU UK always does an amazing job with their playful, chic and evolving collections, drawing the inspiration from the Japanese roots. I'll definitely do my best to grab the rest from this collection! Madly in love with these items, especially 116 SHAKUYOUSA eyeshadow quad! What items are you eyeing for the Spring? The eyeshadow palette and lipstick PR samples offered for consideration. Thoughts my own.